Another city in this impressive series of Then And Now books. They are so interesting and draw you in many, many times. They also make wonderful quality books to show off on your coffee table. Elegant and absorbing. The City of Nashville is an American tradition with it being the home of Country Music and of course, the Grand Ole Opry. It became a permanent settlement in 1779 and was named Fort Nashborough but became Nashville in 1784 and went from a frontier town to a city. Sadly, today, it seems as though so many old buildings were either razed or burnt down but it's a joy these old photographs still exist. Happily, though, the U.S. Customs House (now the U.S. Bankcrupty Court) has been restored, the Hume-Fogg High School still stands, as does Union Station, Jubliee Hall, the Parthenon and the beautiful Holly Street Fire Hall. Some beautiful homes that are still standing are also featured in the book. See the gorgeous old buildings on pages 32/33 that are still standing. What surprised me most, was when I discovered that Nashville was a river city (the Cumberland River), and one worth visiting as I adore cities by water - either a river, lake or sea. What I didn't like was the now "messy" Elliston Place today (pages 88/89). This book has lots of interesting historical facts as well as the beautiful photographic tapestry of this city. Having books like these helps me better understand cities I would like to visit - Nashville being one of many. 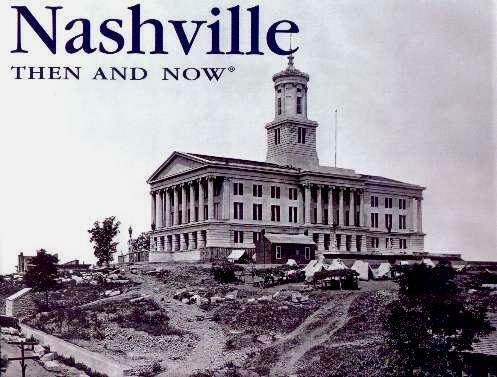 NASHVILLE Then And Now may be purchased and/or ordered through your local bookstore. Conclusion - Now I know what I need to see when I visit Nashville.